Do you ever feel like there’s something you need to do, but you can’t remember what it is? It’s like a weird, unsettling feeling that lurks in the back of your mind, even keeping you up awake at night… but you just can’t bring yourself to remember. What was was so important? What did I need to do? For many commercial kitchen managers, this is a familiar feeling. There’s always a huge litany of essential tasks that need to be taken care of each day, and it can be so hard to keep track of them. Good news! There’s a way to take a bunch of these important tasks off your list. 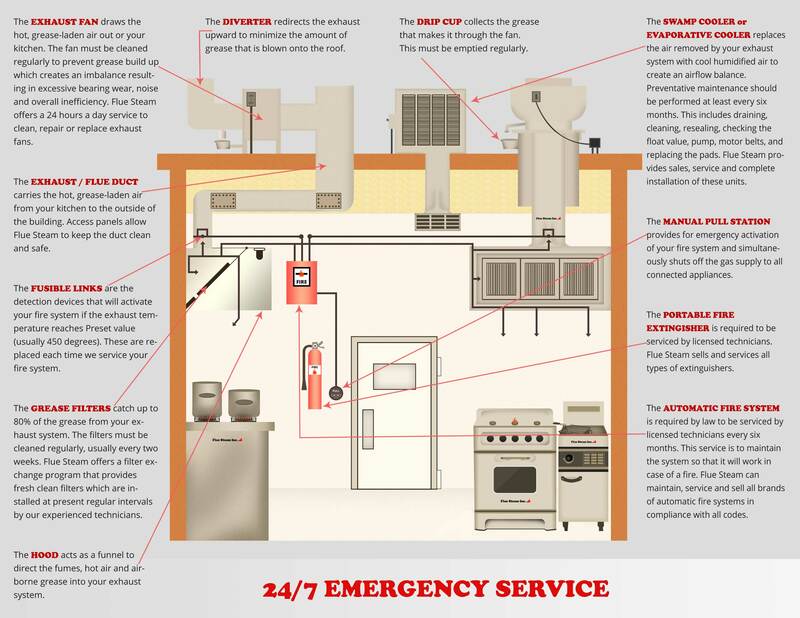 Partner with Flue Steam and we’ll be happy to handle all your commercial kitchen air control and fire prevention needs. 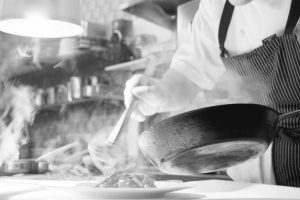 Our goal is to improve the safety, air quality, and energy efficiency of your commercial kitchen and help keep your stress levels low. Learn more detailed information about our services below, and don’t forget to sign up for one or all our services by calling Flue Steam at 800-700-FLUE today. Flue Steam provides complete, high-quality, fire-code-compliant kitchen exhaust system cleaning for each and every commercial kitchen. Our cleaning services include hand scraping and steam cleaning. Hand scraping is a simple, affordable way to remove major grease deposits from all accessible areas. We recommend your business sign up for hand scraping services about once a month. Steam cleaning utilizes hot, high-pressure water to thoroughly remove grease. While it’s more expensive than hand scraping, it’s definitely more thorough. We recommend businesses supplement monthly hand scraping with steam cleaning 2-4 times per year. Give us a call at 800-700-FLUE and we’ll gladly discuss your kitchen exhaust system cleaning needs with you and give you personalized recommendations. After each kitchen exhaust system cleaning service, we’ll provide “Certificate of Performance” stickers to prove that you’ve successfully fulfilled your NFPA code obligations. Inspectors will be thoroughly satisfied and you may even save money on your insurance bills. Take this cumbersome task off your kitchen staffs’ plate when you partner with Flue Steam today. We provide complete grease filter exchange services to reduce your risk of fire and avoid its potentially devastating impact on your business. Count on Flue Steam for fast, affordable, convenient grease filter maintenance service. You’ll never have to wonder whether your grease filters need to be exchanged again! We provide complete automatic fire suppression system services and portable fire extinguisher sales and services for your commercial kitchen. It’s just one more way we give you complete peace of mind so you can focus on other important aspects of managing your commercial kitchen. Call us to begin your partnership today! Our phone number is 800-700-FLUE.